Food of the future: in vitro meat? In 1932, Winston Churchill predicted that in fifty years “we shall escape the absurdity of growing a whole chicken in order to eat the breast or wing by growing these parts separately.” Now, almost eighty years later, we may finally be getting close to producing in vitro meat – muscle tissue grown in the lab – without the rest of the animal. Why would we need in vitro meat? Humans have been eating farm-raised meat for centuries, so why would we choose to eat meat produced in a lab? The United Nations Food and Agriculture Organization estimates that thirty percent of the earth’s ice-free land is directly or indirectly involved in livestock production already . As the global demand for meat grows, it is necessary to evaluate the sustainability of current meat production. One set of reasons to consider developing in vitro meat concerns the environmental impacts of conventional large-scale meat production. According to the United Nations Food and Agriculture Organization, raising livestock produces twenty percent of human-related greenhouse gas emissions. In fact, it is responsible for more greenhouse gas emissions than the transportation sector . Large amounts of fossil fuels are burned throughout the process of meat production in the production and transport of feed; the housing, transportation, and slaughter of livestock; and the processing and transportation of meat. Additionally, ruminants like cattle produce the greenhouse gas methane as a byproduct of their digestion and processing the nine-hundred million tons of animal waste produced in the US each year releases methane and nitrous oxide into the atmosphere and pollutes groundwater . To put this environmental effect into perspective, the greenhouse gas emissions eliminated by a twenty percent reduction in American meat consumption would be equivalent to all Americans switching from driving a standard sedan to a hybrid Prius . There are also potential health benefits to eating meat produced in laboratories. For instance, contamination with bacteria like Salmonella and E. coli could be reduced. In vitro meat production could eliminate contact with animal contaminants like feces, thereby helping to resolve the most common cause of food-borne illness in the US . Tightly controlling the percentage and types of fat could also make lab-grown meat healthier. In vitro meat could be produced with limited amounts of saturated fats and be rich in beneficial omega-3 fatty acids. The meat we eat is muscle harvested from livestock. Scientists have been able to grow cells, the basic units of all tissues, for more than a century. One way to produce muscle tissue in the lab is to grow cells that are capable of becoming muscle cells and organizing themselves into muscle tissue. Most cells are committed to being a certain type of cell, like a nerve cell or a skin cell. A small portion of cells called stem cells retain the ability to mature into more than one type of cell. Both embryonic and adult stem cells can grow into muscle tissue in the lab. To date, work to isolate embryonic stem cells from livestock has not been successful, so most current work has focused on the use of adult stem cells from livestock to grow in vitro meat. Adult animals have muscle stem cells called myosatellite cells that are responsible for muscle growth and repair. Scientists can obtain these stem cells from animal tissue by breaking up the material that holds the cells in the tissue together and extracting the muscle stem cells. The cells grow in plastic dishes bathed in a nutrient rich broth. Under these conditions, the cells grow and divide, making more muscle cells. Scientists try to mimic the conditions that produce muscles in animals. For example, muscle cells are grown on scaffolds that encourage the development of muscle fibers. Additionally, muscle cells grown in the lab need exercise just like muscle cells in an animal to “bulk up.” Scientists use electrical, physical, or chemical methods to increase protein content in the muscle cells and to try and replicate the texture of muscle from an animal. To create edible meat, scientists would harvest the muscle fibers created in the lab, grind them, and add flavor and nutrients to produce something like hamburger or sausage. Current research is focused on creating in vitro meat with a texture similar to conventional meat and developing the technology to grow large amounts of in vitro meat at an affordable price. Reprinted by permission from Macmillan Publishers Ltd: Nature, copyright 2010. Why isn’t there in vitro meat on my plate right now? One major hurdle facing the development of in vitro meat is the nutrient broth the cells need to grow and divide in the lab. A major component of this broth is derived from animal blood, which is both expensive and partially defeats the purpose of in vitro meat. Animal-free alternatives have been tested, including components derived from mushrooms and algae, but these are currently too expensive to be used for large-scale production. Another challenge of in vitro meat production is the difference in texture between lab-grown and natural meat. In an animal, large masses of muscle tissue are able to survive and grow because a vast network of blood vessels delivers nutrients to cells throughout the tissue. To ensure that the nutrient rich broth reaches all cells, current lab-grown muscle can only be produced in small pieces and used to make ground meat like hamburger. Until scientists develop a way to nourish cells at the center of larger sections of muscle tissue, a lab-grown steak remains a thing of the future. 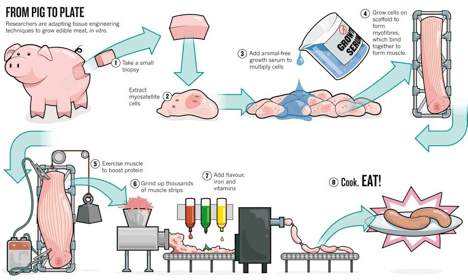 Mark Post, who works at Eindhoven University of Technology in the Netherlands and has been growing in vitro pork, estimates that he will need another year of research to be able to make a single sausage from muscle strips grown in his lab. Post also estimates that it will take $160 million to commercialize in vitro meat production  and the In vitro Meat Consortium estimates that first generation lab-grown meat will be about twice as expensive as conventional meat . Some non-profit organizations like New Harvest provide small grants for in vitro meat research, but without a large increase in funding it will be awhile before you can sink your teeth into a juicy burger made from in vitro meat. Allison Nishitani is a graduate student at Harvard Medical School. Mead, P. et al. “Food—Related Illness and Death in the United States.” Emerging Infectious Diseases. 1999. 5: 607. Jones, N. “Food: A taste of things to come?” Nature. December 8, 2010. 468: 752-753.